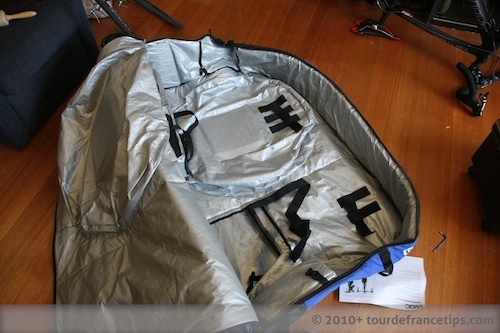 In this How to Pack a Bike Bag article, you’ll see how to pack your EVOC Bike Travel Bag. Although this is specific to this particular bag, the principles can be applied to any bag. 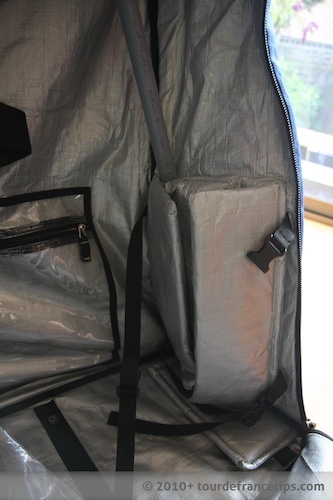 In a previous How to Pack a Bike Bag post I showed how to pack your bike in a Polaris (or Polaris OEM copy) bike pod. 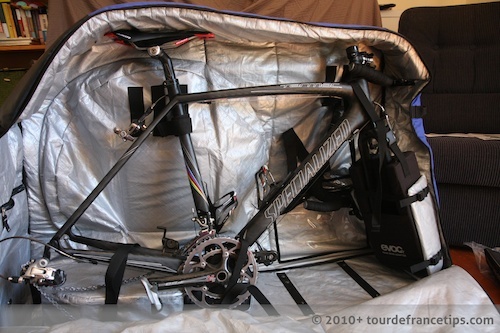 If you’re not familiar with the EVOC, I highly recommend you check out my EVOC Bike Travel Bag Review, with video and photos. I’ve created a video showing you how to pack a bike bag in under 8 minutes, but you’ll probably want to take some time to study the photos too. The EVOC does a pretty good job of protecting your bike as a result of its design. There isn’t too much more you’ll need to do to make your bike ultra safe, but I’ve included a couple of extra safety tips below. First up, I remove the bike’s handlebars. 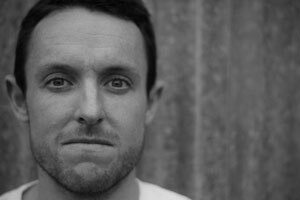 You can remove your pedals if you want to lessen the chances of a pedal getting wacked and putting pressure on the cranks, but, depending on your bike size and pedals, you probably will be ok only taking one, or none, off. 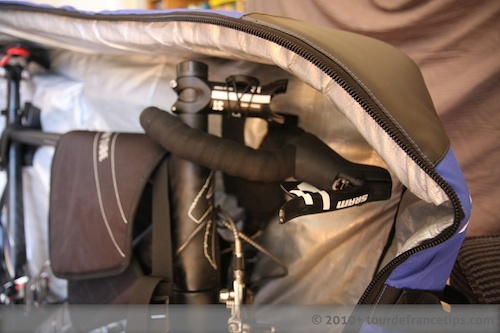 A pedal wrench isn’t too heavy and can be put in the bag’s tool pocket, so it’s probably better to take both off. The wheels are removed from the bike. I also put the supplied fibreglass stringers in their places at the rear of the bag. These help hold the bag in shape when it’s upright and come in handy when you’re putting the bike in. Next, I lay the bag on the ground. It is easier to place the bike and secure it without gravity working against you! 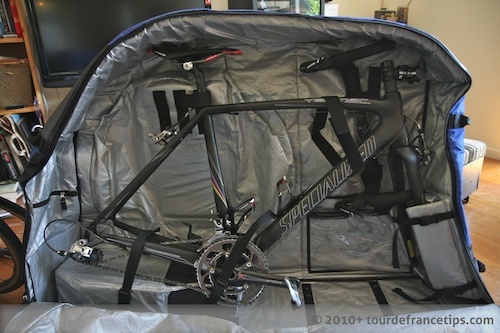 The bike is simply placed in the bag. Sorry about the sideways photo. I secure the seat post using the straps. 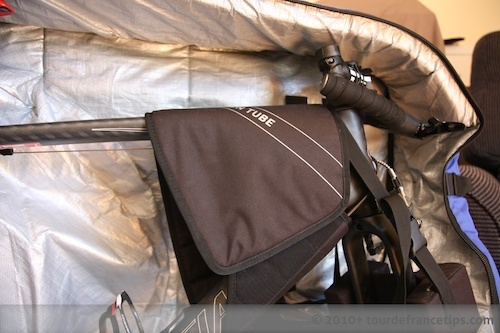 Note that for bigger or smaller bikes (mine is a 54), you can move the straps fore and aft as required. 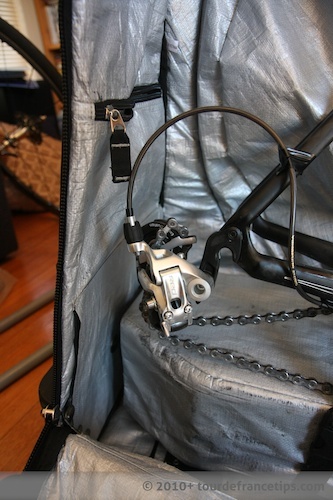 The forks sit inside the EVOC Road Bike Adaptor Kit (sold separately – Wiggle, Chain Reaction) and are secured to the frame as well as internally to the bag. Before securing your frame with the frame straps, put the Road Bike Adaptor Kit frame protector around the top and down tubes as shown below. The handlebars can go behind the bike or on top. As I use Yokozuna cables, which are very stiff, the positions I can put the bars in are pretty limited. I put them on the top usually, but here you can see them on the bottom (under the bike). Note that I have not fitted the adaptor kit padding yet (step above). 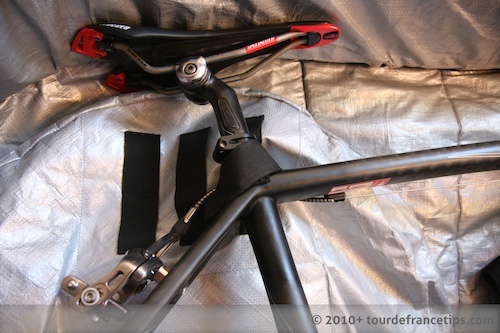 You can also see the strap that is used to hold the bike down, securing the bike using the top and down tubes. Next, we need to secure the chain stays. 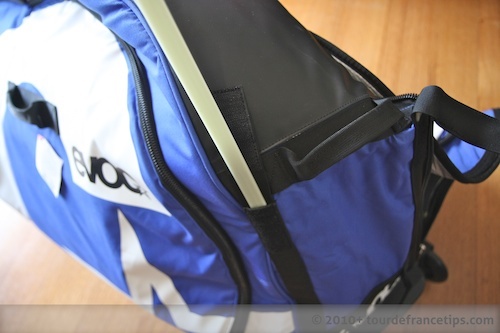 The EVOC Bike Travel Bag provides a block that can be moved forward and backward, that the bottom bracket and stays rest on. The straps secure the bike as shown. 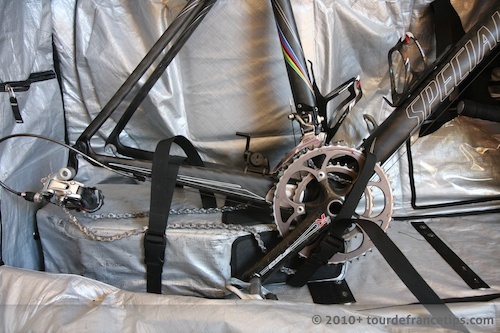 When I pack my bike for a trip, I always wrap a towel or bubble wrap around the cranks/bottom bracket, the chain stays and the rear D/R. before I strap the bike in, to protect the frame and straps from each other. 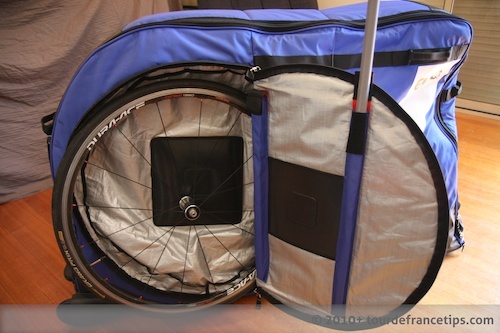 The wheels simply slot into the side pockets with skewers off. Make sure you add the plastic piping inside the holders. These pipes help provide protection for the wheels. I always tape my rear D/R back so give it more clearance (see below) then wrap bubble wrap around it. I also add some padding on top of the seat, around the headset and stem, and make sure the shifters are protected. If you have Shimano shifters, you’re at less risk here as the the brake levers rotate inward, unlike SRAM. So that’s pretty much it. 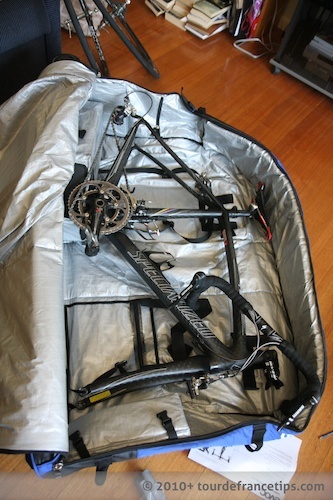 It’s very easy to pack your bike in the EVOC Bike Travel bag, and I find it easier and faster each time. 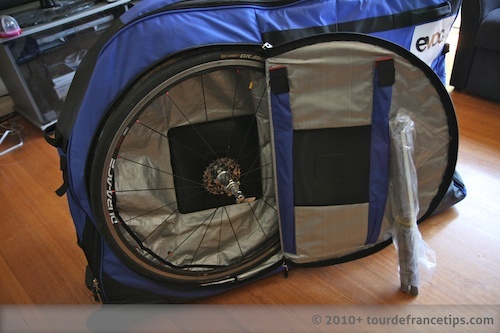 Once again, I highly recommend you check out my EVOC Bike Travel Bag Review, with video and photos. You can get the EVOC using the below links. Disclosure: these are affiliate links. Nice work on the explanation. I always use plastic spacers in the forks. It may be overkill, but I also always remove the rear deraileur and wrap and tape it to the back stay as it makes me nervous out by itself. Murray, I agree, for the 2 mins it takes to secure the D/R it makes sense to remove it. 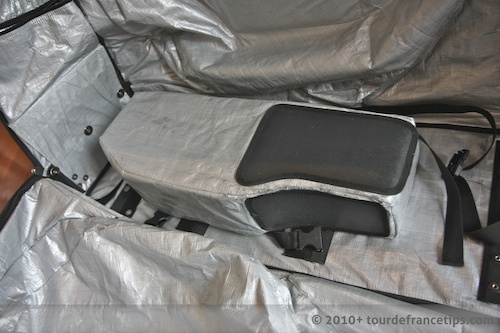 I’ll update the post (I did mention this in the Scicon Aero Comfort Plus Review I did).